What It Is: Proof that great gift ideas don’t have to be mind-blowing when it comes to cost or otherwise. Charles Viancin’s pot lid covers are an ingenious solution whether you’re microwaving food or storing it in the fridge. 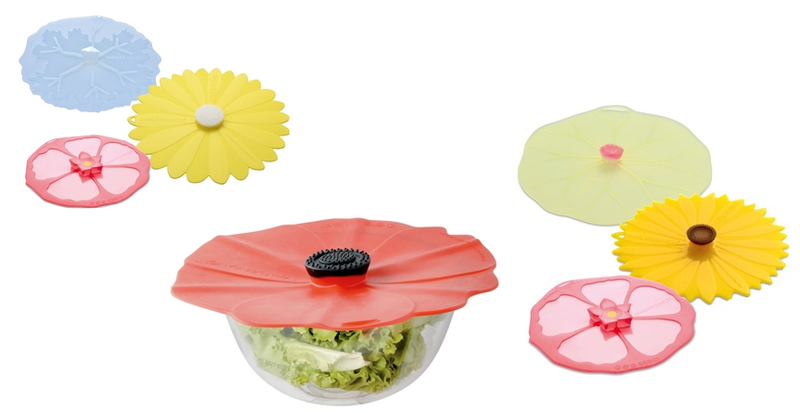 Available in a ton of fun styles inspired by flowers (as well as more original interpretations like a lilypad and snowflake), these universal lids prevent spills by creating an air tight, water tight seal to whatever dish you place them on. Safe for the microwave, oven, freezer, and dishwasher, they’re easy to maintain and can be used again and again. What’s not to love? Who It’s For: Your wife, as a pretty stocking stuffer she’ll actually use. Your friend, as a fun housewarming present. The hostess, to stash those party leftovers. What It Costs: Prices start at $7.99 for a set of two small covers. Where It’s At: I’ve got two Canadian sources for you: Fenigo and Linen Chest. BONUS entry into yesterday’s Hippie Princess giveaway – tell me in the comments below what you think of this product and what your fave design of it is! I love this idea – I’ve been looking for these type of lids for some time, and I love that these are fancier than normal. The yellow sunflower one is my fave! not for me – Probably just another gadget cluttering my cupboards – the sunflower does stand out though. I like the sunflower lid and I know this is something I would use. As someone who needs a course on how to use plastic wrap, this is great! I love the poppy design. I like the purp;e daisy & the hibiscus flower as well as the sunflower but would I use them? probably not. the sunflower they are all so pretty it is hard to chose. This product is unique. I like the poppy. I would love to get a set of these covers! They are a great idea! Thanks for the contest! I like the green one that looks like a lily pad..what a great idea! I love the sunflower. I would buy one. I love this idea! Cuts down on plastic wrap and is pretty and practical? The sunflower is my favourite. I think the idea is great if you eat out on your back deck a lot. I always used to find that keeping the flies off of the food bowls while we went back in for more of the bowls was a challenge. We usually had to leave one of the family members at the table to shoo away the flies. We do not eat outside much anymore so not so useful for us but it is a great idea. I like the sunflower one -bright and cheery. I saw some of these in a store in St. Jacob’s -the store has gourmet food and kitchen items. They had lots of options. I would go for the sunflower. Neat idea. I think it’s a great idea. I hate plastic wrap so much and it hates me too! 🙂 This would save me a lot of frustration! I love the giant yellow sunflower one! The sunflower would go great with my kitchen theme. I am forever trying to find covers for things.